Information Radiators are a great way to make things transparent for a team or organization. The radiator pictured above I a sprint health radiator. It can be used however you choose to implement and using whatever colors you select. I just happened to be using a white board and green, blue, and red dry erase markers when I created the one pictured above. You could also make this smaller on a flip chart and create a new one daily to show progress over time which is really cool because the team can see how far they’ve come each day. It also shows them when new work is added to the sprint or when things are not moving along as expected. Take care to ensure that this information radiator is used to display and radiate information that is useful to the team to see the health of the sprint and make decisions about changes they might need to make in the way they are working. Don’t use this as a whipping stick to prod the team to work harder, faster, or more recklessly! Let me give a description of the radiator parts, options, and how it’s used. WORK STATES: To Do, In Progress, Accepted. These are the states I used on mine because these are the states that my team was using. If you team has a state for Dev, Test, or Done then use the states the team actually uses. Or you can combine all “in progress” states into one simple “progress”. You can change “to do” to “not started” if you like. So, I guess what I’m saying is take the concept of the radiator and apply it. Cater the labeling to your team. What it says isn’t as important as what it does. How these states are used: I give a legend of what specific colors mean so when people look at the radiator they know what they are seeing. The numbers written in the colored blocks can represent the number of stories in those states or the number of points. DO NOT use hours. As you can see the size of the colored in area corresponds to the number of points or stories in that area. The intention here is to show how much work is in progress so the team can see how much is complete, in progress, and no started in a sprint. Remember, since the team should be limiting WIP this will show if they have more work in progress than accepted or waiting to start. 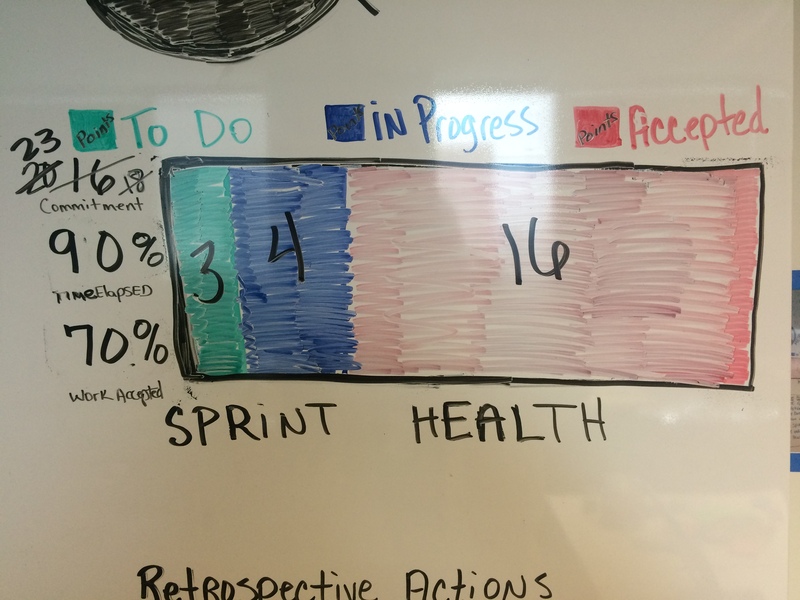 It gives them a quick visual of the state of the health of the sprint so they can make adjustments to how they are working or what they are working on when they meet for the daily scrum. Therefore, this should be updated before the daily scrum so the team can have current information to make decisions. I often find this radiator much more helpful than the burndown but not always — it just depends on what the team really needs to know to be successful. You could create just the part of the visual I described and get tons of value for the team. On the radiator pictured, I have some other things added: Commitment, Time Elapsed, Work Accepted. Again, use these as needed and in the best way to radiate information for your specific team. For this team, they were having problems continually adding unplanned work to the sprint so I needed a way to radiate that information and how it impacted the success of the sprint. So, I put the number of points the team originally forecast during sprint planning on the radiator. You could use the number of stories here instead if you choose to add this to your radiator. During the sprint, when the team added work, I crossed out the original number (do not erase) and I wrote the new number next to it. As you can see in the sample shown, this team added unplanned work 3 times during the sprint and went from 16 points (which is likely their average velocity) to 23 points. Having this shown on the radiator gives the team a talking point during retrospective when they are looking for improvement areas they can investigate and implement experiments for change. The next item, time elapsed can be written in number of days or in percentage. You could also change this to say time remaining. What would your team respond to best? Use that. This helps the team get a quick view of how much time is left during the sprint and how much work they still need to finish. If they are taking in too much work and ending the sprint with a lot of work started it will help them see that if they started less they would actually complete more. Since working software, not started work, is the primary measure of progress it is more important to finish than it is to start. Lastly, on this sample I have the percentage of work completed. You could just as easily put the number of points or number of stories. OR you could put the amount of work not finished, at risk, etc. For this team, they had an internal goal of always finishing 95-100% of the work selected for a sprint (predictability metric) so this was a motivator for them to see how far they were from their goal. It also told them if they went over 100% of the original amount of work every sprint that they weren’t taking enough work into the sprint to begin with. Lastly, it told them how adding unplanned work impacted their predictability goals. If you choose to use this radiator, take some time to modify it and get the right measurements for your team. Information radiators are meant to be catered to the team using it to ensure that it reflects the right information they need to make the right decisions. It should also encourage and motivate rather than deflate and demotivate the team. Sent me a picture of your Sprint Health Radiator if you choose to use this with your team!